In the past, Fitalle and her husband would support their family by farming their quarter hectare of farmland. Since it wasn’t enough for their family of five, they also worked as share crop farmers on other people’s land. This year, even that hasn’t been enough. Fitalle has sold her livestock and other assets in order to buy food. With those resources depleted, she was out of ways to feed her family. The young mother of three children is not alone. Across Ethiopia, families like Fitalle’s have been struggling to survive as the region endures its second year of inadequate rainfall. This year’s drought is the worst the country has seen in 32 years and has left hundreds of thousands of people with severe food shortages. Ethiopia is just one of several countries struggling this year as a result of El Niño weather. In some countries, El Niño has caused flooding but in many the result has been severe drought. Disasters have been declared in Zimbabwe, Malawi, Mozambique, Zambia, Indonesia and Ethiopia. Presbyterian World Service & Development is responding. 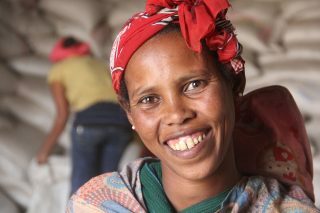 Working with our partners at Canadian Foodgrains Bank, PWS&D is helping provide food rations to 41,043 people in the Dugda district of Ethiopia. Fitalle and her neighbors are receiving vegetable oil, maize and pulses to meet their daily food requirements. For families with children under the age of five, famix—a protein rich food supplement specially designed for young children—is being provided. Fitalle’s smile as she receives her family’s food rations is a testament to just how much this support means to her and her family. It has been a true answer to prayer and will sustain them until they can plant again. You can make a donation to PWS&D’s drought response through your church, by mailing a cheque to the office, donating online, or calling 1-800-619-7301 x291. Please mark all donations “Africa Drought Response.” Please give today. *Adapted from an original story by Kristen deRoo VanderBerg, posted on the World Renew website.